Solutions for your banking needs. Your checking account should be readily accessible and easy to use. 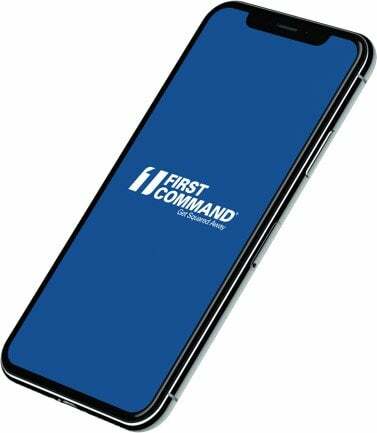 With features like unlimited check writing, a debit card and OnCommand™ online banking, First Command Bank offers all that — and more. From a teenager’s first account to an interest-bearing checking account for yourself, we have a solution that’s right for you. Earn interest while enjoying the convenience of a checking account that’s loaded with features. Encourage your teens to deposit their allowance or earnings from part-time jobs by setting up a Teen Checking account. To place an initial order for checks, call Customer Service at 888-763-7600. 2. Find the account for which you want to order checks. 3. Click the “Order Checks” link on the right. Checks ordered online may be shipped to U.S. addresses and APO/FPO addresses. If you have a foreign address, call us to place your order. How do I select a PIN for my new Debit Mastercard™? What’s the daily purchase limit of my First Command Debit Mastercard™? You can make purchases of up to $3,500 a day using your First Command Debit Mastercard™, if your account balance allows it. The amounts are deducted directly from your checking account, and the purchase history is detailed on your monthly bank statement and in OnCommand account transactions. How can I raise the daily purchase limit on my First Command Debit Mastercard™? You may request that your daily purchase limit be changed by contacting our Personal Bankers Monday-Friday, 7 a.m.–6 p.m. Central Time, at 888-763-7600 or by sending a service request through OnCommand. The daily ATM withdrawal limit for your First Command Debit Mastercard™ is $1,000. What types of overdraft protection do you offer? At First Command we encourage responsible financial management, but we recognize that there are times when you need some flexibility. That’s why we offer two types of overdraft protection: Overdraft Program and Coverdraft. An overdraft occurs when you don’t have enough money in your account to cover a transaction, and we pay it anyway (fees apply). The Overdraft Program provides an Approved Overdraft Limit of $500, subject to credit approval. The Overdraft Program is not available on the Teen Checking account. Coverdraft automatically transfers funds directly from another First Command Bank Deposit account when there are insufficient funds in your checking account at the time of the withdrawal/transaction. Note: We reserve the right not to pay an overdraft if your account is not in good standing, if you aren’t making regular deposits, or if you have too many overdrafts. To learn more about overdraft protection, please reference your Depository Agreement and Disclosures booklet. Are there fees for the Overdraft Program and Coverdraft? While there’s no cost to set up overdraft protection, you’ll be charged an overdraft fee per item paid. You’ll have up to 30 days to pay back the amount owed by making a deposit into your account. View the Overdraft Protection Disclosure. There is no fee for the Coverdraft transfer. You have the option to set a predetermined amount for transfers (such as $250, $100, etc.). With this option, the specified lump sum will transfer when a Coverdraft is needed, helping to reduce the number of potential transfers. If you choose not to set a predetermined amount, only the amount needed to cover the transaction will be transferred for each separate transaction. Coverdraft transfers from a First Command Money Market Savings Account are included in the federal limit of six withdrawals/transfers per month. Withdrawals exceeding the limit will incur a fee. How will I know if I have used the Overdraft Program? eStatement users will receive a notification email detailing the transaction(s) and fee(s) for the items paid under the Overdraft program. If you’re not an eStatement user, we’ll send you a notice by mail. Know your current balance and keep track of your spending. Use OnCommand Account Alerts to monitor your account activity. Review your account statements monthly with eStatements. Schedule your bill payments in OnCommand or MobileCommand to control when funds move out of your account. Take action quickly to deposit funds when needed. Funds can be easily transferred between your accounts using OnCommand and MobileCommand. Deposit a physical check in minutes using the MobileCommand app on your iPhone or Android smartphone. We post mail and in-person deposits until 3 p.m. Central Time Monday–Friday (except holidays). For funds availability on Mobile Deposits, please see our Funds Availability Policy in our Depository Agreement.